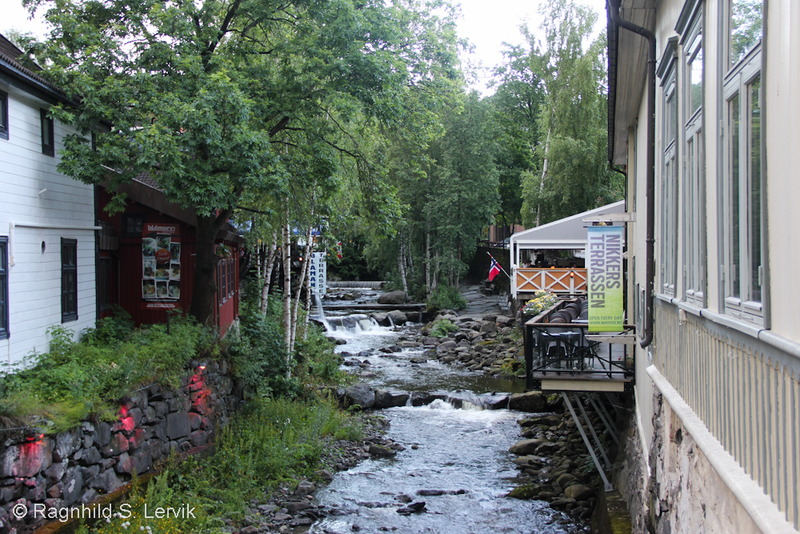 At the start of our summer vacation we stayed two nights in Lillehammer in order to visit the Hunderfossen amusement park. 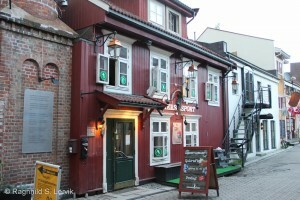 Two nights’ stay means one evening per adult to investigate Lillehammer’s pubs and beer selection. Arve had done some research and identified two likely pubs (well, three, but Lillehammer Brewery, who also have a pub, was not open Monday and Tuesday, which was the days we were there): Nikkers and Heim gastrobar. The former has two sections, one sports bar with a reasonably good selection of beers, the other a restaurant which gave the impression of catering well to families with children. So Monday we tested Nikkers restaurant for dinner. The adults had beer from Austmann and the kids got coloured pencils and a children’s menu with built-in activity booklet. Everyone was happy with the food and the kids got a balloon on the way out. 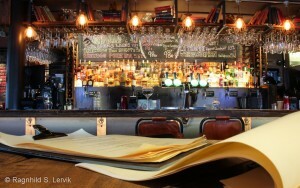 Conclusion: A perfectly decent place to eat, with a few nice beers available, even if the selection was limited. Later in the evening I started my pubcrawl at Heim. I had an Ægir Skjeggjøld (bottled), since there was not anything I felt particularly tempted by on the 8 taps at that moment. Well, 12 taps, to be exact, but four of them were branded Heineken taps, so I didn’t really count them. 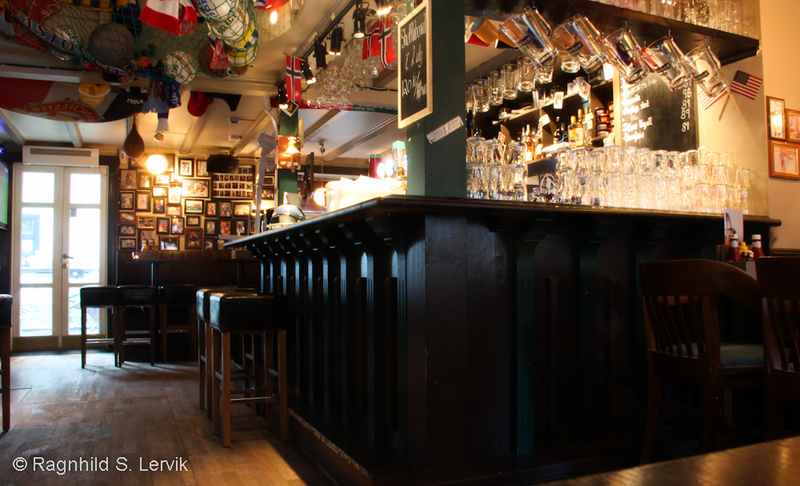 On the important 8 taps were Nøgne Ø Blonde, La Trappe Trappist Quadrupel, BrewDog 5am Saints, Brewdog Punk IPA, Nøgne Ø Saison, Ægir IPA, Samuel Adams Boston Lager and Weihenstephaner. The selection of bottled beers was considerably more impressive, and they even had three proper. The food was priced at an acceptable level and smelled delicious (since I’d already eaten I didn’t test it). Of stronger liquids I counted 50ish Scottish single malts and around 20 various whiskies (Irish, Japanese, Swedish, bourbon and blended). 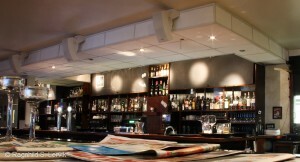 Heim have a food and drinks club called Heimkunnskap, arranging tastings regularly. If you’re staying nearby for an extended period, I recommend checking it out, as an example Martin Markvardsen will be visiting in August. Unfortunately I was suffering from a cold, or I’d probably have stayed at Heim for the rest of the evening, writing tasting notes for whisky. As it was, I moved on to visit a sports bar. Oh yeah. 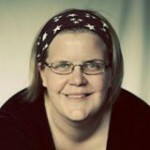 At Nikkers Sport I had a Samuel Adams Boston Lager from tap. The other beers they had on tap were Founders All Day IPA (well, empty just when I was there, but branded tap), Newcastle Brown Ale, Paulaner, Strongbow and Heineken (why, Lillehammer, why?) 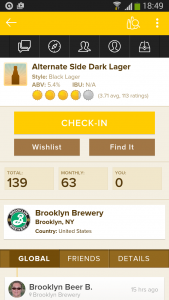 in addition to 20-30 bottled beers. 5-6 single maltes, including Blair Athol Flora & Fauna 12 years old of all things, I hazard a guess that it’s been there for a while. If such things were allowed in Norway, I’d have offered to buy the remaining contents, including bottle, to bring home, but as I couldn’t it’s still there (untill someone has the sense to drink the lot). Accoring to the menu, simple food was available in the form of burgers, club sandwich and chicken salad. As a sports bar Nikkers (I’d tend to say: unfortunately) up to its name. There were big screens on all walls, impossible to seat oneself in a manner not looking directly at one, and football (BRA vs KRI) on every one. But the pub was empty, so it was otherwise quiet, I buried my nose in my book (Funny Girl by Nick Hornby, I warmly recommend it) and ignored the irrelevancy. 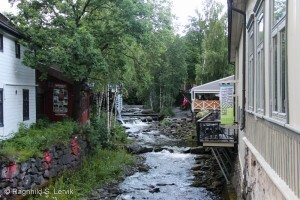 The outside seating of Nikkers restaurant at right, Blåmann just visible on the left by the waterfall. While we ate at Nikkers restaurant earlier I had noticed a place on the otehr side of the river calling itself Blåmann Gastrobar. Without any exalted expectation I wandered over there to check it out. All I can say is I hope they focus on food and perhaps win, because in the beer and spirits departments I found them woefully lacking. 3 Highland Park (including the 30 year old, perhaps they go for the people with money? ), 2 Macallan and 1 Laphroaig. After a while I noticed a few more bottles hidden on a dark shelf, I could identify Lagavulin 16, and 5-6 American whiskeys were also available. Beer-wise they had Ringnes on tap (not Heineken, hurrah!) and five-six bottled. The interior design in the bar area I found a bit… odd? I got a “posh hotel lobby”-vibe. 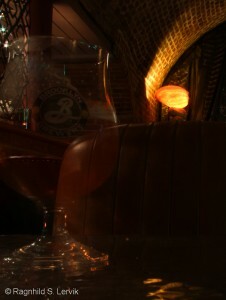 Sitting down at the bar was certainly not inviting, so I retired to a corner with my book. I had a Franziskaner Dunkel Weisse, and it was very nice, thank you. 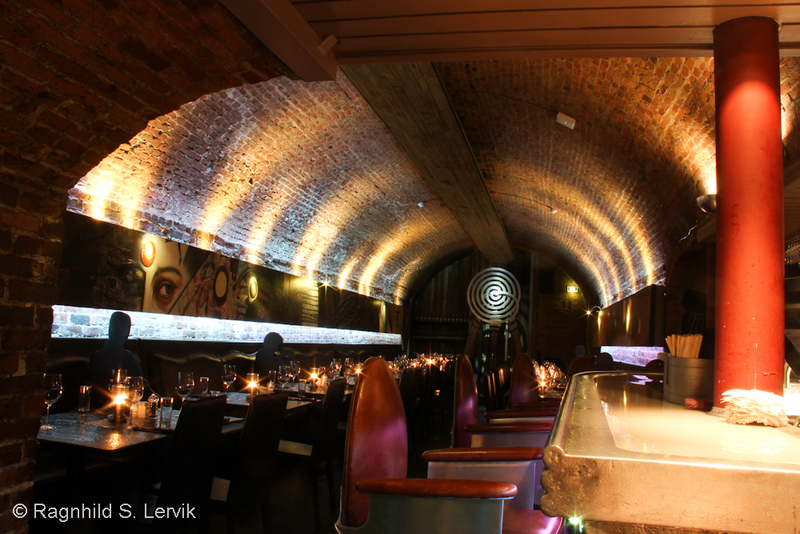 The restaurant section of Bryggerikjelleren, there was an identical vault on the other side of the bar. As Lillehammer bryggeri was regrettably not open on Mondays, I ended my pubcrawl with a stop at Bryggerikjelleren. Well, the setting was cool, at least. 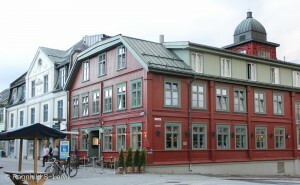 Bryggerikjelleren is really a restaurant, but they have an area near the entrance that works better as a lounge for a beer or two. You’re supposed to wait to be seated, which was a problem for me, since, being on my own, I did not make enough noise and no one discovered I was waiting until another party got in line behind me. Being three, they were talking among themselves. Other than that I would advice that they proof read their menu before they have quarrelsome customers, because in the menu it said “Brooklyn Dark Lager”, while what I was served was a standard Brooklyn Lager. I suspected as much before I ordered, so I couldn’t be bothered to complain, but it was vaguely disappointing nonetheless. After Bryggerikjelleren I ended my crawl. My recommendation would be to stick to Nikkers and Heim – and Lillehammer bryggeri, Wednesday to Saturday. I’ll make sure to visit them at a later date. 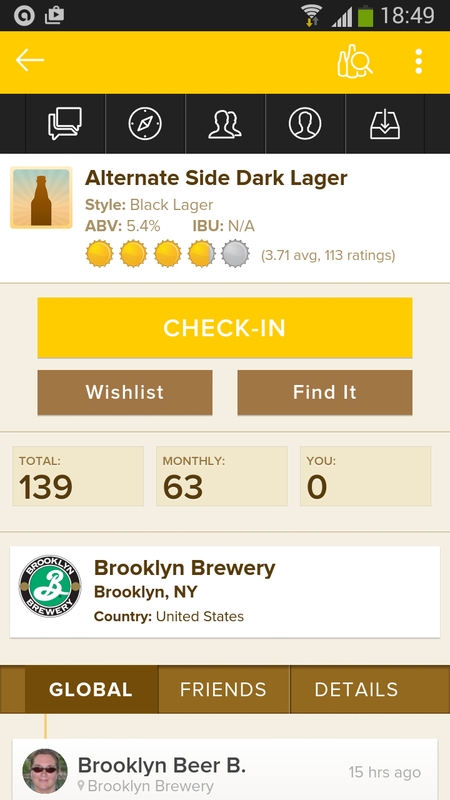 Just to show it was not entirely unreasonable to hope that Brooklyn Dark Lager would appear before me.